Transfer on Death Designations – Are They an Estate Plan? | The Levin Law Firm - Philip Levin, Esq. Transfer on Death Designations – Are They an Estate Plan? Over the past year, an increasing number of clients have asked me about transfer-on-death (TOD) designations and how they can play in to their estate plan. TOD designations are quite common in the financial industry. They operate very similarly to a beneficiary designation on life insurance or a retirement account. You complete the TOD designation and when you pass away, the account funds are transferred to the person you designated. At some banks, you may find them called POD (pay on death) or ITF (in trust for) accounts. Despite their name, ITF accounts are Not trusts (more on that in a moment). At many credit unions I see them called beneficiary designations. 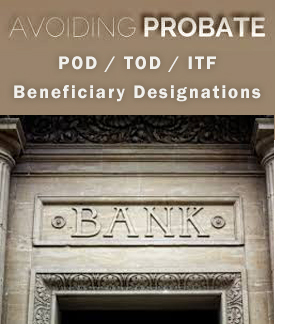 To be clear, TOD, ITF and beneficiary designations are not the same thing from a legal standpoint, but they operate the same way when someone passes away. Indeed, these are very valid questions! As indicated above, even if specific accounts are designated as ITF for a beneficiary, such accounts are NOT a trust? That’s true for all of the acronyms – ITF, TOD and POD. And it is the reason why most experienced estate planning attorneys do not consider TOD designations to be “real” estate planning. That is because “real” estate planning will take care of all the contingencies you can think of in the event of your passing. For instance, most TOD designations allow you to designate one person, or class of people (e.g., children), as beneficiary. You cannot name a backup or contingent beneficiary. If the person you name is not living when you pass away, the account goes through the probate process. And if the person you have designated as beneficiary lacks legal capacity when you pass away, a Guardianship proceeding may very well need to be raised in order to have a Conservator established for your beneficiary through the local probate court – that costs time and money and is often a protracted public proceeding! A Trust, on the other hand, allows you to cover all the contingencies you can think of, and likely some that you may not think of. Among other things, you can state under the terms of your Trust exactly how you want your property to be distributed if one or more of your designated beneficiaries is not living when a distribution is made. And if someone lacks legal capacity, you can have his/her portion held in trust for his/her benefit, removing the necessity of a Guardianship proceeding in order to appointment a Conservator. Please note that a TOD designation and a Trust do not need to be mutually exclusive. We regularly use them together to increase convenience for clients during life and distribution in the event of their passing. For example, we regularly work with clients to have one or more of their bank accounts distributed under a TOD designation to their Trust. We hope that this edition of Estate Planning Matters helps clarify some of the financial account acronyms we often use in estate planning.